Spigen’s Bounce case for the Samsung Galaxy Note 3 didn’t impress us all that much, partly because it’s nothing more than an entry-level protective case with a bland design. For the cost though for it, we can’t complain all that much, but something in the back of our head makes us yearn for something so much more. Well folks, the Spigen Neo Hybrid case looks like it’s going to do the trick just fine, seeing that it absolutely complements the handset’s design – while also giving it some good protection as well. Visually, the Neo Hybrid case is pretty stunning, since its contrasting colors help to draw attention to it. Just like its other Neo Hybrid cases for other smartphones, this one for the Note 3 is comprised out of two components – a thermoplastic urethane body that’s strengthened by a colorful polycarbonate frame that hugs the sides of the case. 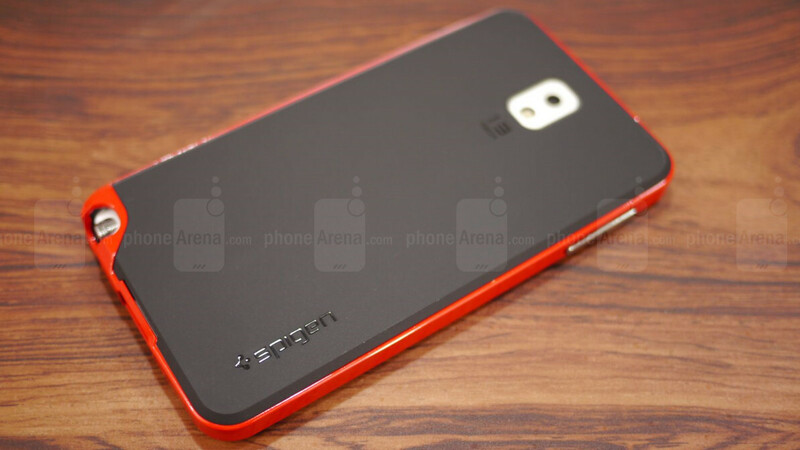 With the TPU back cover, it’s a rubbery material that gives the case its protective nature. At the same time, it’s the part that absorbs shocks in the event it’s dropped. Meanwhile, the exterior polycarbonate frame simply keeps the entire thing intact. Then again, we really appreciate how the bright red color of our particular review is a great accent color for the case. Overall, the case looks stunning, and it doesn’t really add a whole lot of bulk to the handset. Indeed, the Note 3 by itself is beefy thing to hold, but we’re glad that the Spigen Neo Hybrid case is extremely form-fitting and minimizes any unwanted heft. Not only is it a pretty darn good looking case, but it’ll even protect the handset to some extent – though, we’d imagine lengthy drops might still scruff it up, especially when the display is left exposed. So the case is normally priced at $34.99 online, which might be a bit much for some people. Nevertheless, it’s a premium case that has that great combination of having an eye catching look with a fair amount of protection. Interestingly, Amazon currently is selling it for less at $24.99, so it's a small piece of consolation to any prospective buyer. Therefore, if money isn’t a concern and you want to keep the Note 3 in tip-top condition, then the Spigen Neo Hybrid case is going to be a perfect option for you. I own it. i am returning it unfortunately. The hole for the headphone jack is too small and my car adapter jack is the "L" kind. looks awesome tho. It definately is a 1 drop case.... after that the plastic will break the rim. I almost get this, thanks for the info, now I will wait to improve the/ resize the hole for earphone of it. I'm eyeing the white and black combi for my black gnote3 . I hope spigen will react immediately. I don't have this particular case but I have the ultra fit Spigen in white and it's awesome. It's quite thin so it fits in my pockets comfortably. The added protection gives me a peace of mind knowing it's safe. I just ordered it. I was planning to purchase the neo hybrid case initially but as spectre1006 pointed out that the headphone jack is small, I decided on buying this one instead.Thanks for the heads up mate. And to spectre..Cheers! I currently have this case, and I love it! I'm waiting to see if they will come up with the Slim View Armor for the Note 3, besides that none of their cases interest me. I owned this case for my iPhone 5 and loved it. The frame is strong but does not add bulk and easy to take on and off and can take it (I removed mine daily to fit a flat iPhone 4 adapter for a music system and have NEVER had a problem. Basically most any case with hard sides and cushioning will survive most drops (my opinion only based on having a cell at all times since 1987). AS some have noted above the screen is an issue. I likely would not by any case without first purchasing SPG's glass screen protector; while admittedly expensive worth it considering the cost of the phone (their is a video showing an intentional screen break with the SPG glass; protective glass did not survive but the screen was in perfect condition. No matter what company makes a case (and I am still looking honestly) I would never go without the glass screen protector (also not all the same; got one from carrier which was a waste of money and not much thicker than a regular protector. Just something to think about for those concerned with display protection. Thanks, this the case I using now, it's perfect and I love it. The only drawback, is that it add bulk and weight to the phone. As for the screen, I bought Spigen Crystal Clear screen protector and it's compatible with the Neo Hybrid.